In conjunction with Norfolk County Council and the Norfolk and Norwich Millennium Library, Nwes are pleased to be able to offer FREE advice sessions for people hoping to start or grow a business, and are looking for help and direction. In a half-hour one-to-one meeting with Vic Short, Business Advisor at Nwes, your session will be tailored to the specific needs of you, the business owner, and can cover a wide range of skills and knowledge that are required to run a successful business. Vic will be available every Tuesday from 1-4pm in The Advice Room, Ground Floor, Norfolk and Norwich Millennium Library, The Forum, Norwich. A new exhibition will be coming to town which is all about business in Thurrock. 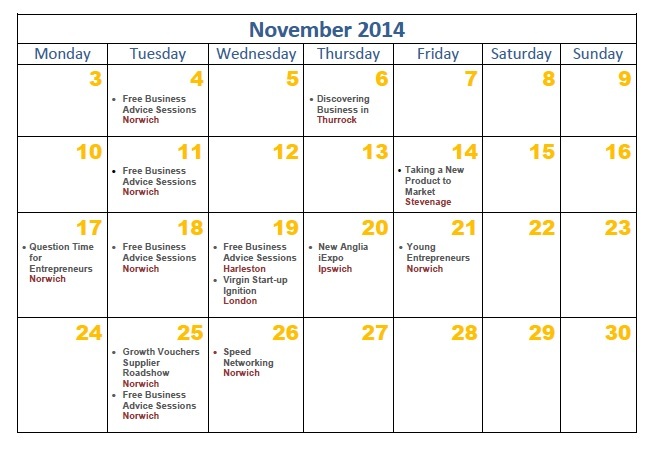 Don’t miss this exciting opportunity to discover that Thurrock is open for business! Click for more info. Are you developing a new product? Unsure of how to get into the market? Want to find out about the support available to you as an innovator? This event will provide you with key information on all aspects of taking a new product to market as well as a great opportunity to network with other entrepreneurs. Places are limited and are on a first-come, first-served basis. Early booking is advised! Please note that this event is only available to those based in Hertfordshire or Bedfordshire. Quiz some of Britain’s top business brains about the issues that really matter to you. Learn how entrepreneurs have grown their businesses into some of the best-known brands in the UK today. In Norwich, this event will be screened live for free, and Ali Clabburn, founder of liftshare.com. , will also be giving advice and tips. Afterwards, there will be an opportunity for networking, and light refreshments will be served. For more information click here. Tailored advice and support to help you make the most of your business idea, including developing your business and financial plans, marketing, and to help you identify areas you may have overlooked. Virgin StartUp is on a mission to ignite female-owned start-ups across the UK. We’re bringing together entrepreneurial women with the aim to start or grow a business and offering them practical support, useful introductions and real-life advice. We’d love you to join us. This event will celebrate Women’s Entrepreneurship Day by inspiring and connecting women who are following their dreams and launching their own businesses. Learn about Haptic technology, the science of touch, at iExpo, New Anglia’s innovation exhibition. Haptic systems enhance virtual environments to help a person physically interact. This extraordinary technology can be used in a range of applications including specialised medical training to simulate medical procedures; rumble effects in gaming consoles and has widespread uses in mobile devices, robotics and virtual reality systems. Meet the Haptic experts from University of East Anglia Consultancy Ltd, which helps companies and organisations to access world class research and development. See first hand their Haptic device at iExpo and learn about the range of fascinating applications. To find out more and register for the FREE event click here. What are the first steps when starting a business? Find out at the Young Entrepreneurs event for on 21 November. More information from The Forum events page. For information and supplier insight into how to become a preferred supplier on the Growth Voucher scheme. Four existing suppliers will be on hand giving an informal networking opportunity to learn about the services offered to businesses and suppliers under the scheme. For further information about the Growth Voucher scheme click here. Speed networking gives you a quick and focused opportunity to meet people and businesses that could help propel your business. This relaxed networking event is designed so you can engage with every participant. So come along, meet new people and have fun!